When you are in a conversation, do you listen with your own autobiographical filter? Or do you listen to actually understand the speaker? 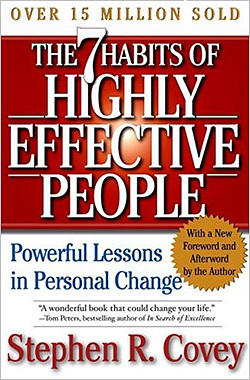 We continue our Leadership Hall of Fame series, a year-long look at the top business books and authors, with an excerpt from The 7 Habits of Highly Effective People (1989) by Stephen R. Covey. behavior. They prescribe their own glasses for everyone with whom they interact. head. He looked into his own head and thought he saw the world, including his boy. may be ignoring another person, not really listening at all. We may practice pretending. fifth level, the highest form of listening, empathic listening. autobiography in the actual interaction, but your motive in listening is autobiographical. seeking first to understand, to really understand. It’s an entirely different paradigm. way they see the world, you understand their paradigm, you understand how they feel. Empathy is not sympathy. Sympathy is a form of agreement, a form of judgment. eyes and with your heart. You listen for feeling, for meaning. You listen for behavior. You use your right brain as well as your left. You sense, you intuit, you feel. Empathic listening is so powerful because it gives you accurate data to work with. and interpretation, you’re dealing with the reality inside another person’s head and heart. withdrawal when a person regards your efforts as manipulative. wouldn’t care about anything except getting air. Survival would be your only motivation. Reprinted with permission from The 7 Habits of Highly Effective People. Copyright © 1989 by Stephen R. Covey. Excerpted with permission by Free Press, a Division of Simon & Schuster, Inc.
Read more about The 7 Habits of Highly Effective People or our Leadership Hall of Fame.